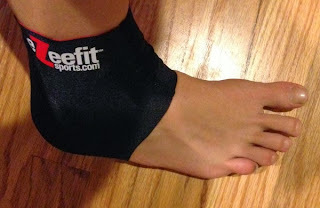 No blisters today: my foot is loving Ezeefitsports' Bootie. To put it simply, I get a lot of foot blisters. Whether it's running shoes, cycling shoes, après-ski boots, or mary janes I'm wearing, I've managed to get blisters somewhere on my feet. In between the toes, on the toes, on the back of my heel...you name it, and I've most likely had a combo of band-aid and first-aid tape covering it. So when I heard about Ezeefit Sports' Anti-Friction Ankle Booties, which are said to help protect feet from rubbing and blisters, I was all for seeing if they'd banish my blisters for good. These ankle booties are form-fitting, soft (well, as much as neoprene and lycra can be), and said to be good for any sport where the footwear causes blisters. Plus they're not so thick that they feel weird underfoot--I went with the ultra-thin option, but they're also available in 2mm and 3mm thicknesses. I even forgot I was wearing the Booties as I tested them out. Strange since the last time I wore a bootie of sorts (think pull-on ACE bandage) to protect what I thought was a wonky ankle, the foot wearing the bootie felt double the size its sans-bootie partner. And the last thing it wanted to do was squeeze into a shoe. But they passed my first test: warding off the ankle rub from my winter boots that once tore the skin right off the back of my foot and caused me to limp home. I can only assume they'll do the same in my hiking boots, the ones that felt fine until I wore them snowshoeing racing and could feel even the thickest, warmest, most comfortable socks rubbing in all the wrong places. Ezeefit might suggest wearing their Ankle Booties instead of socks or inside thin socks, but I'm thinking they'll make the final stretches of those snowshoe races less intense on my feet. Score! Now if only we could get more snow on the ground so I can take the snowshoe for a spin. So maybe I can't get away with wearing them with those mary janes in my closet, but I can definitely wear these in the other shoes that tear my feet apart on high-mileage days. And finally a solution to my socks that like to slide down farther and farther into my shoes. For more detail or to order a pair, check out www.ezeefitsports.com. Disclosure of Material Connection: I received the Anti-Friction Ankle Booties for free from Ezeefit Sports as coordinated by Deep Creek Public Relations in consideration for review publication.